If God plays dice with the universe, who's the house? 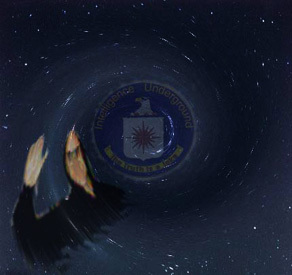 Recently, while searching through intelligence archives at Langley, Virginia, I came across a thin black folder containing several faded typewritten pages; the documents appear to be notes of a cosmological nature, written by an unknown CIA officer around 1964. It seems this CIA official was undertaking classified research into fundamental properties of space-time and their potential harnessing for intelligence purposes. The results of said project (if indeed there were any results) have not been recorded for posterity, or are sufficiently classified such that neither I, nor anyone I know at CIA, is aware of them. Ironically, the author of the notes in the small black folder in question is listed as one "John A. King." Given that covert CIA employees are routinely assigned generic-sounding cover names like this, I’m assuming it’s just a coincidence (your humble intelligence officer, John Alejandro King, could not possibly have composed these documents in 1964, since that was the year, more or less, of my birth). In any event, a careful and thorough examination of the afore mentioned writings is certain to convince even the least/most cleared of readers that formal release of these papers by the Agency would not be in the interest of our Universal Security at this time. Accordingly, pursuant to Executive Order 13292, and to ensure that these most top secret of documents shall remain as obscure as possible, I’ve chosen to retire the original hardcopy manuscript, and post the transcribed record here on this little known, rarely accessed web page. Thus may we be heedful of the admonition of the Gospel: There is no secret that shall not not be brought to light. How about: forged letter men? The end is surely near, no? And when didn’t he talk it? Are you fluent in a language other than America? Are you loyal to the United States of English? Why don’t you wish to work for the Central Intelligence Agency? Do you currently possess US Government security clearances? Do US Government security clearances currently possess you? Are you prepared to bring people to life if directed by your superior to do so? Did you know I’ve been watching you from the satellite this entire time? Are you going to eat the rest of that coleslaw? Did you know you’ve been watching me from the satellite this entire time? Was the applicant in the above story hired, and if so/if not, why? When will you be born? When will you have a current address? When do you intend to be convicted of a felony? When will you be illegal drugs? 1. Acquire dangerous microorganisms, and/or dangerous toxins derived from dangerous microorganisms. 2. Seal the dangerous microorganisms, and/or dangerous toxins derived from dangerous microorganisms, safely in a containment device. 3. Attach the device containing the dangerous microorganisms and/or dangerous toxins derived from microorganisms to a dissemination mechanism (such as a high explosive – though I strongly advise against it). 4. Congratulations, you now have a biological weapon. And also (ironically) ... minimal parasites! And who really built the World Trade Center? When is a safe house safe? Think you know its meaning? Can’t you see the one I’m pointing at? How much is that poem? For that piece of loony verse?! Hey, anybody heard from Zum’r? ... And who hasn't worked too much already? I hold you in my heart! My clandestine clan, my true intelligence agents! The following is a transcript of a classified briefing that describes research I will apparently undertake in the future regarding certain complex properties of space-time and their potential harnessing for intelligence purposes. Given the potential sensitivity of the subject matter, the results of this project (if there are to be any results) will likely need to be treated as black as possible. Toward this end, in addition to typing up paper copies for analysis and follow-up action (if any), it may be advisable to collocate an ‘electronic’ version of this transcript on the new ‘internal data network’ currently under development within the US Intelligence Community. In this way we can ensure maximum compartmentation of this project in the near term, while making certain that only the most highly cleared have access to this information in years to come. I say: compared to what? Black you. Black you very much. Black you. Black your very touch. Failed writer? I'll have you know I've written numerous times! Thank you ladies and gentlemen, and please believe me when I say: you're going to be a great audience!